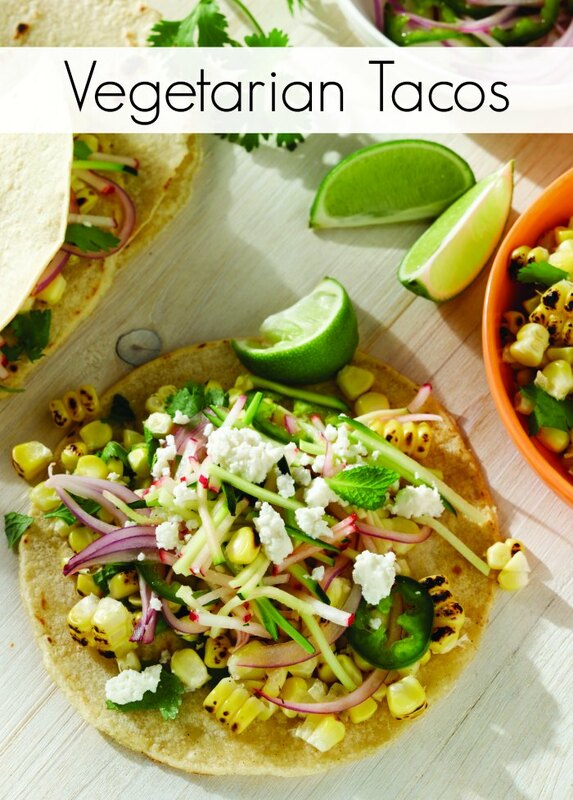 If you’re looking for a summery and vegetarian alternative to the typical taco, look no further than these charred corn veggie tacos topped with a radish zucchini slaw. They’re have you cheering that warmer weather is finally here. Some days a girl just needs a taco… but not some greasy gut bomb. Sure, when I was in my 20s, there was nothing better than hitting one of the local Mexican taco shops in Chicago. Didn’t matter if it was early Wednesday evening or 2am Friday night. But those days are gone! 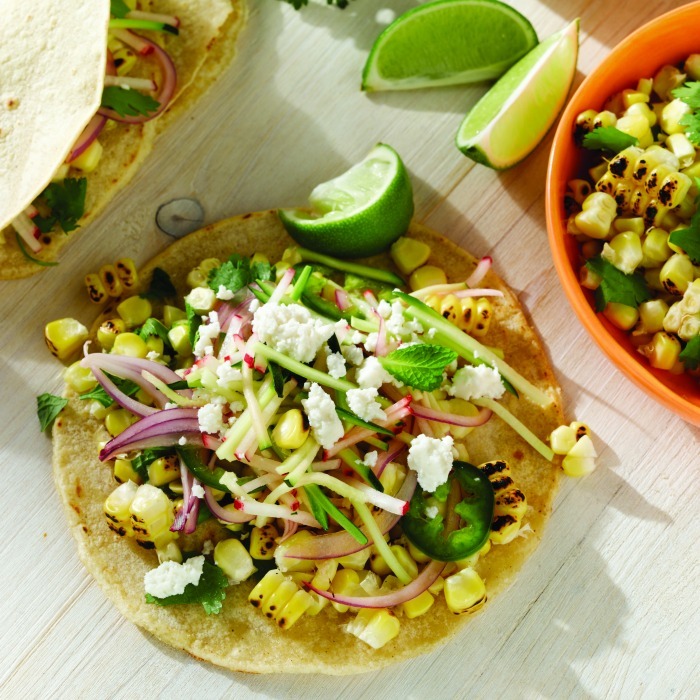 Now when I head out for a taco, I often enjoy a more alternative option – and these charred corn veggie tacos fit just the bill. You’re going to particularly love the charred flavor of the corn on the grill. Oh my goodness yum! Brush corn with olive oil and season with salt and pepper. Over hot grill or open gas stove flame, char ears of corn until well blackened but not completely burnt. Remove from heat; cool. With large knife, shave off kernels into bowl. Add cilantro, parsley and mint; reserve for later. In small bowl, combine onion and lime juice; let stand 10 minutes. Stir in maple syrup, radishes, zucchini, jalapeno and 2 tablespoons of oil. Season with salt and pepper; set aside. Heat your tortillas one of two ways: Wrap whole stack in foil and place in warm 250 degrees F oven for 15 minutes, or coat cast-iron skillet with thin layer of oil and heat over high heat; warm each tortilla 30 seconds to 1 minute each side, until lightly blistered. A summery and vegetarian alternative to the typical taco. To make tacos, fill each tortilla with ¼ cup corn. Top with cheese and radish-zucchini slaw. Serve with lime wedges, if desired. Your recipe looks so fresh with veggies, thank you for sharing your delicious recipe on the #OMHGWW this week! Just Pinned to save and share!! Jenny,am new to your blog,but sweetheart,let me tell you…Think I have pinned,printed and already re-created some of your recipes in the last few weeks!Am ACTIVELY promoting you on Pinterest, (only social media I do),am a huge Jenny fan!Well done and so very appreciated! (Some of your recipes I have made,ALL have been pinned on multiple boards for MAX exposure).Good sharing,I say!! Well welcome welcome welcome to The Jenny Evolution! Glad you’re loving my recipes and I appreciate you sharing them on Pinterest 🙂 I’m excited to make some of these recipes for our neighborhood gatherings this summer… I love to share! I love healthy food! Thanks for sharing at Foodie FriDIY. Looks so fresh. And a healthy recipe too. Thank you for linking up with us at #HomeMattersParty. We would love to have you again next week. This looks just so fresh and flavorful!! Thanks for sharing with us at Throwback Thursday!